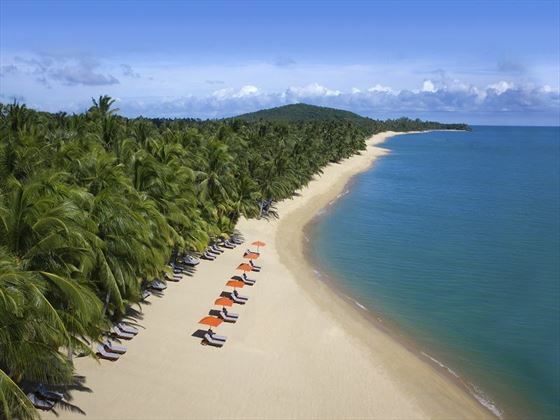 Located under half an hour away from Koh Samui airport, the Santiburi Resort is a wonderful tranquil getaway, right on the beachfront of Koh Samui’s pristine north shore surrounded by tropical oasis. 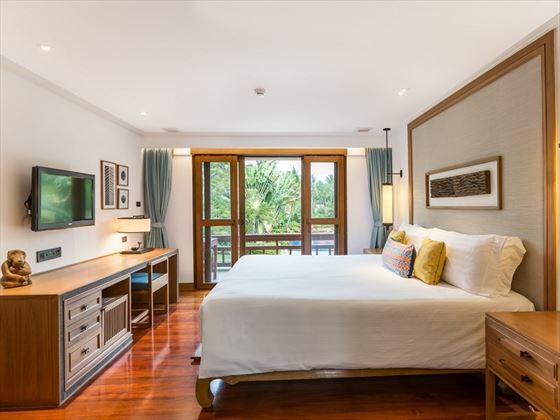 One Bedroom Duplex Suite – These two storey suites feature a private balcony overlooking the main pool and tropical garden. The bedroom is on the first floor, with the living room above on a mezzanine, bathroom features separate rain shower. Sleeps a maximum of three adults, or two adults and one child. 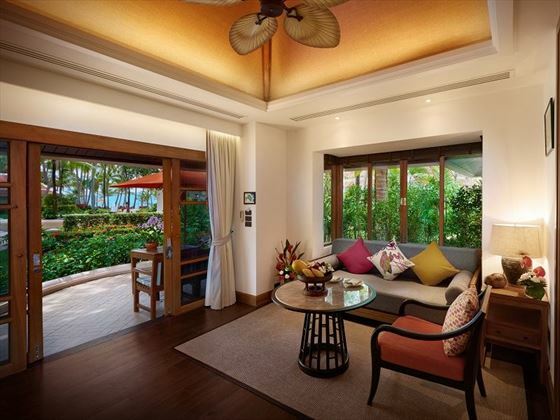 Deluxe Garden Villa – Gorgeous villas with a private terrace looking over the tropical gardens. The living room is adjacent to the bedroom with a marble ensuite featuring a bathtub and shower. Sleeps a maximum of three adults, or two adults and two children. 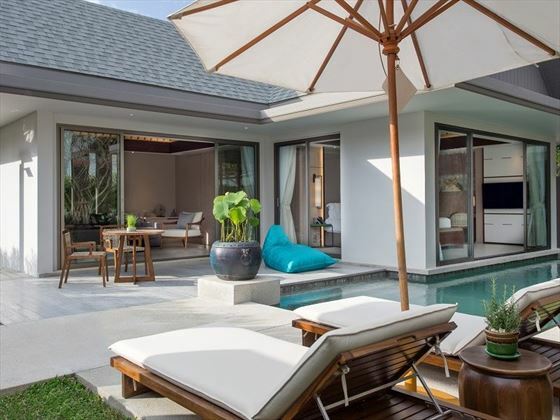 Grand Deluxe Garden Villa – Once the Orchid and Dahla Villas, these spacious villas have a master bedroom and cosy lounge area, separated by a sound-proof wooden sliding door, marble ensuite with bathtub, separate shower and walk-in wardrobe. They also feature a large, private terrace. Sleeps a maximum of three adults, or two adults and two children. 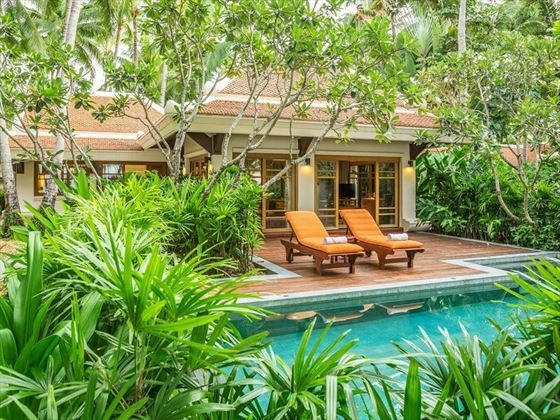 Grand Deluxe Garden Villa with Plunge Pool – With the same amenities as before, plus a plunge pool surrounded by walls for privacy. Sleeps a maximum of three adults, or two adults and two children. 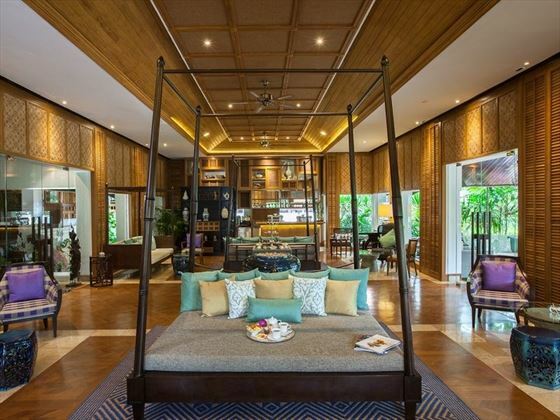 Deluxe Pool Villa – These opulent villas feature a large veranda with a private swimming pool and sunbathing area, surrounded by walls for privacy, and a gorgeously decorated master bedroom, ensuite with bathtub and shower and a living room. Sleeps a maximum of three adults, or two adults and two children. 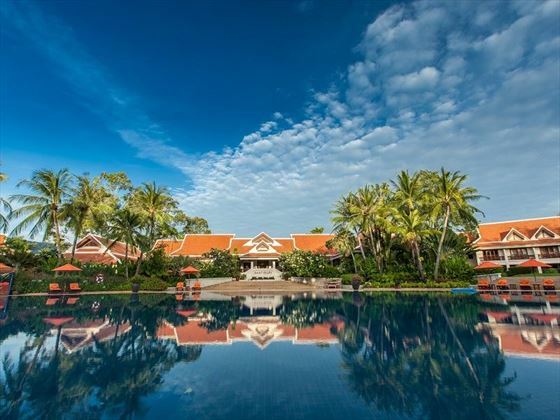 Grand Deluxe Pool Villa – Previously the Spa Pool Villa, these villas reflect Thai heritage and culture, featuring a Thai ‘sala’ for private spa treatments, plus a private pool and lounge area. Sleeps a maximum of four adults, or two adults and three children. 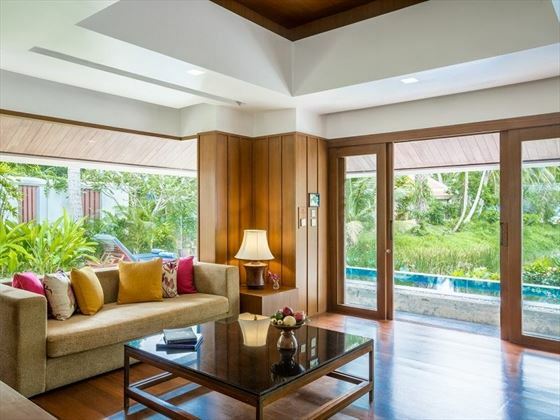 Grand Reserve Pool Villa - There are 19 of these new pool villas, boasting their own hidden tropical garden and 40sqm pool, an ultra-modern bathroom with a centrepiece bathtub and rain shower, a gorgeous master bedroom with direct pool access, and a trendy lounge that leads out onto the outer deck. 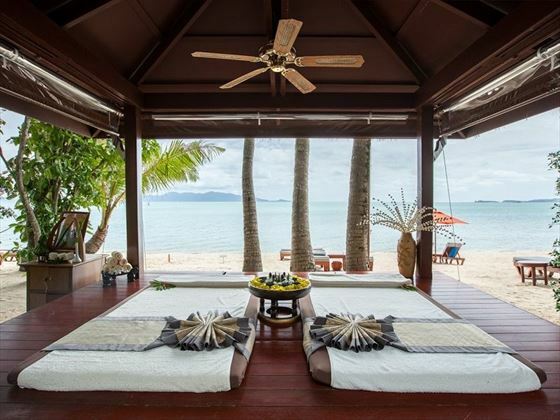 Deluxe Beachfront Villa – Nestled right on the beautiful beachfront, the master bedroom and living room is again separated by a sound-proof wooden sliding door for privacy, marble ensuite with bathtub, separate shower and walk-in wardrobe. Sleeps a maximum of three adults, or two adults and two children. 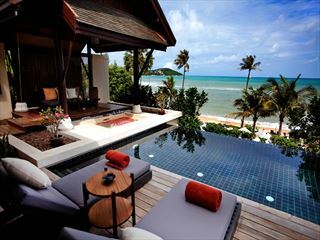 Deluxe Beachfront Villa with Plunge Pool – With the same amenities and enviable location as before, plus a lavish outdoor plunge pool. Sleeps a maximum of three adults, or two adults and two children. 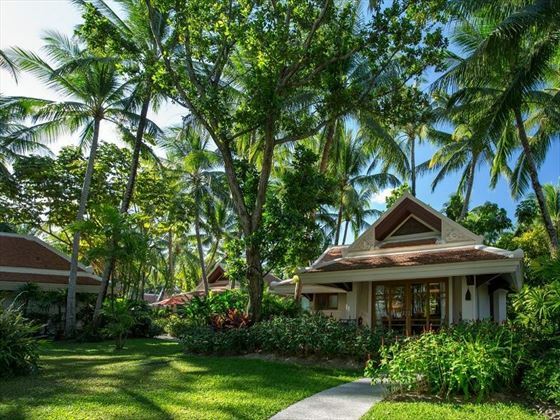 Two Bedroom Grand Deluxe Beachfront Villa with Jacuzzi – A picturesque three villa complex nestled on the beach front, these villas feature a private terrace and Jacuzzi, as well as a garden area leading on to the beach. Sleeps a maximum of six adults, or four adults and two children. 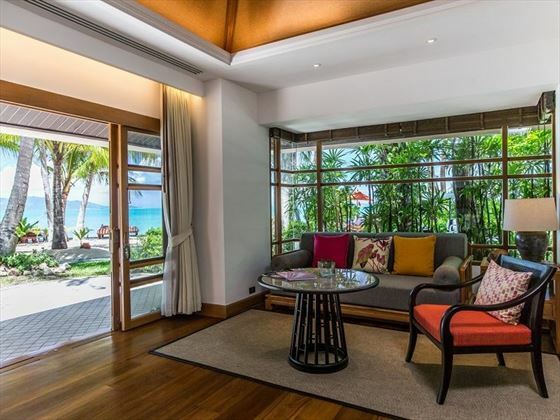 Two Bedroom Grand Deluxe Beachfront Villa with Private Pool – A three villa complex with a large swimming pool, a private dining area and a living room. 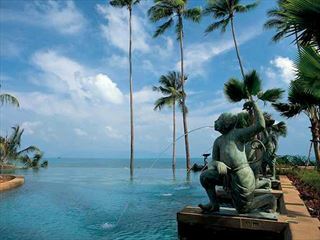 The private terrace faces the ocean, sitting in front of a grass area that leads on to the beach. Sleeps a maximum of five adults, or four adults and two children. 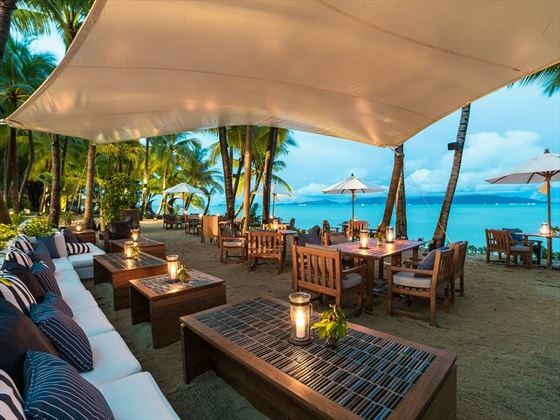 In order to give parents the chance to go out and explore Koh Samui, the resort's Kid's Club operates until 10pm every Thursday. Kid's will enjoy complimentary activities and a movie night between 6pm-10pm. A children's dinner menu is also available at an additional cost. This service is for children 4 years old and above. Family Offer 25% discount for a second room for children aged 14 and under. 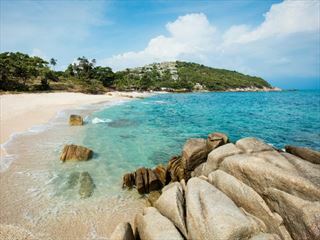 Saving families up to $980 based on 7 nights in the lead in room. When accompanied by one full paying adult room. Early booking offer applicable to first room only.